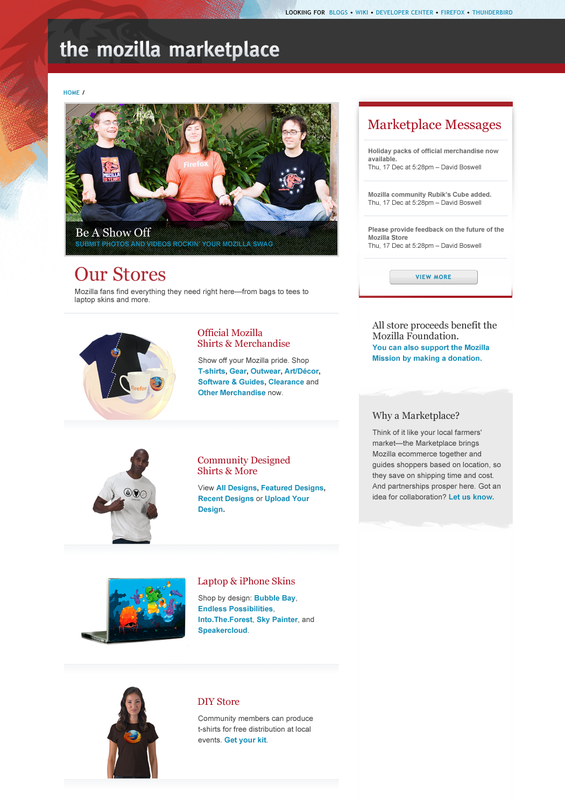 Right now there are three (https://communitystore.mozilla.org/) separate (http://intlstore.mozilla.org/) stores (http://www.infectious.com/firefox) that sell Mozilla merchandise (and we’ve had as many as four stores recently). This is a problem since someone interested in picking up a Firefox t-shirt has no way of knowing that there’s also several cool laptop skins available at another location. We’ve started working on a design for this landing page and want your feedback. Does this make finding things easier? Is there anything you would add, change, remove? Note that this is just a page that links to different stores, so if you want the shirt and laptop skin you still need to order things separately. One possible step we could take to make the experience even better would be to have a single shopping cart that spanned all of the available swag. This is an awesome idea: for note David I would maybe get the categories of each type of item (gear, t-shirts, software guides, art/decor etc…) and have them in a sidebar block. I would also link to any blogs relating to each store. I love the idea though, oh and yes this, is a repost with comment 😜. I am aware of that.